Aleix Espargaró compromised his chances for a good placement in the Spanish MotoGP race with a crash. Forced to start from the seventh row after less than positive qualifiers and due to a penalty incurred during warm up (when he involuntarily found himself on Jorge Lorenzo’s line) which relegated him three positions farther back, Aleix was in a position where he had to overtake a lot of riders straight away. With a decidedly improved feeling astride his Aprilia compared to Friday and Saturday, it only took him a few laps to catch up with Redding, Bautista, Rins, Pol Espargaró and Nakagami. However, shortly after overtaking the Japanese rider, he lost the front end and wound up in the gravel. 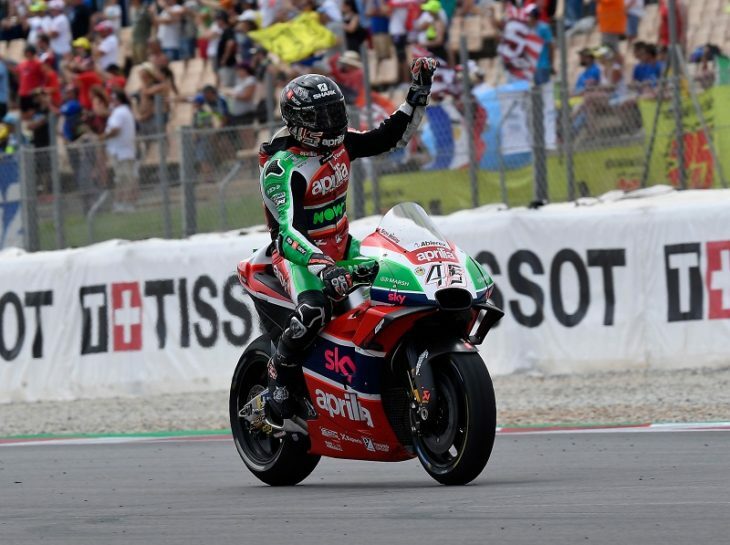 Scott Redding, after a weekend of increasing his confidence with the RS-GP, rode an intelligent race. After finding a good pace, he maintained a very regular rhythm which allowed him to move up several positions and, also aided by a few crashes, finished the race in a good 12th place.